HAVANA, October 31. /TASS/. The Russian authorities are setting up a commission to investigate the sinking of the PD-50 floating dock in Northern Russia and to decide on whether it should be lifted from the seabed, Russia’s Deputy Prime Minister Yuri Borisov said on Tuesday. "Instructions have already been given to set up a commission that would carefully look into the causes, calculate damages and outline response measures. Of course, the situation is unpleasant, but no one is ensured against them," he told reporters in Havana after a meeting of the Russian-Cuban commission on trade and scientific cooperation. The deputy premier said that the commission will be set up by the Russian Navy, because the floating dock belonged to the Russian Defense Ministry, and will definitely include representatives of Russia’s defense industry. He said it was possible that the dock will be lifted from the seabed and repaired. "This is up to the commission to decide, but the ‘yes, answer is more likely than ‘no,’" he said. 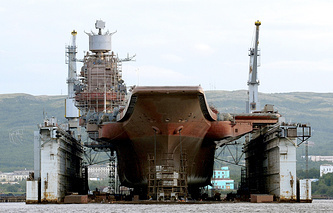 According to the senior Russian official, the incident will not affect the repairs of the Admiral Kuznetsov heavy aircraft-carrying cruiser, which are to be completed in 2021. "We will do our best not to delay the date," he said. Meanwhile, the press service of the Russian Industry and Trade Ministry said an inter-departmental commission will be set up to investigate the matter. "The reasons for the incident will be determined based on findings by an intergovernmental commission, comprising representatives of the Russian Trade Ministry, the Russian Defense Ministry and companies involved. The exact causes can be determined only after the floating dock is lifted," the ministry said in a statement. The decision on whether the PD-50 floating dock should be repaired and put back into operation will also be made after it is lifted. "The overall damage will be determined based on the findings of the above-mentioned commission. The costs of the operation to lift floating dock and restore it will be compensated by the side that will be found guilty of allowing the incident to happen," the document said. 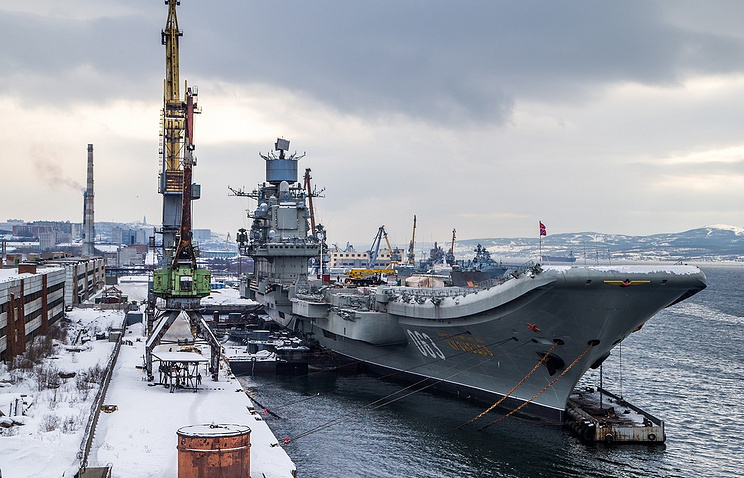 The PD-50 floating dock sank overnight to October 30 in Murmansk during the planned exit of the heavy aircraft-carrying cruiser Admiral Kuznetsov, the Russian Navy’s only aircraft carrier. According to preliminary information, the warship itself had its take-off deck damaged by the fallen crane and is now at the 35th Ship Repair Plant. The Zvyozdochka shipyard said the incident will not delay the Admiral Kuznetsov repairs. Zvezdochka Shipyard spokesman Yevgeny Gladyshev has told TASS that the incident was caused by a power surge. "For now, the circumstances look like this: when [Russian aircraft carrier] the Admiral Kuznetsov was lowered, a power surge occurred from the shore, pumps shut down, and the dock sank," he said. Four people were injured in the accident. A criminal case was launched. The PD-50 is one of the world’s largest floating docks and the biggest in Russia. It was built in Sweden in 1980 on order from the Soviet Navy. It is 330 meters long and 67 meters wide and has a lifting capacity of 80,000 tonnes. The floating dock has an area of 22.1 sq. km, which is slightly less than Red Square in Moscow.